Hurricane Maria made landfall in Puerto Rico early on 20 September as a strong category 4 Hurricane, packing maximum sustained winds of 155 mph. The island received significant damage, including the loss of both radars (TSJU and TJUA). Given the vast devastation, WFO Miami was providing service backup for Puerto Rico. Without radar coverage over the island, forecasters needed to rely heavily on other datasets such as satellite imagery from GOES-16. To provide the best/most information possible, a GOES-16 1-min mesoscale sector was available continuously over Puerto Rico. Having this sector was especially important because, from checkout position, the GOES-16 5-min CONUS sector coverage ends halfway across Puerto Rico (Fig 1). Outside of that sector, coverage is 15-min. On 30 September, a tropical wave interacting with an upper-level trough was producing strong thunderstorms near Puerto Rico. Given the expected heavy rain and already saturated soils, a flash flood watch was issued for the island. During the morning, strong thunderstorms were oriented just south of the island. The appearance of these storms in satellite imagery led to the issuance of a Special Marine Warning per warning text (SOURCE…SATELLITE IMAGERY INDICATED). The 1-min GOES-16 IR/VIS sandwich image combo shows the burst of thunderstorms and warning product. On 11 September 2017, the NWS Pueblo WSR-88D radar (KPUX) was taken down for emergency repairs. KPUX would not come back online until 24 September. While the Denver radar (KFTG) could be used by Pueblo forecasters during the outage, the loss of KPUX meant significantly reduced radar coverage for southern Colorado. Radar coverage is poor to begin with in the western part of the Pueblo CWA (mountains and mountain valleys) due to radar beam blockage. To help compensate, NWS Pueblo requested GOES-16 1-min mesoscale sectors when high impact weather threatened the region. KFTG failed on 23 September, a day on which widespread heavy rainfall and strong-severe thunderstorms were expected across southern Colorado, and would not return to service until later that evening (0300 UTC). With both KPUX and KFTG out, NWS Pueblo forecasters were left using radars such as CYS and GLD, whose lowest beams scan roughly 20,000 ft AGL over Pueblo and Colorado Springs. NWS Pueblo requested a 1-min mesoscale sector, but was denied due to coverage over Puerto Rico (ongoing cleanup efforts from Maria with their radar down) and ongoing Hurricane Maria. Maria was out at sea with no TC Watches or Warning in effect, so it is unclear at the time of this writing why that sector was not moved over Colorado. On 23 September, therefore, NWS Pueblo forecasters relied heavily on GOES-16 imagery (5-min), lightning data, and ground truth. One severe thunderstorm warning was issued for a storm in far eastern Colorado, where KGLD provided adequate information. The greatest forecast challenge for PUB existed over the southeast mountains and adjacent plains, where periods of heavy rainfall went undetected by radar. With shallow warm rain processes dominant, the precip was oriented below the lowest available radar beams. Two flood advisories were issued by PUB during the evening. The radar composite animation below demonstrates coverage over Colorado from 2300 UTC – 0400 UTC, during which both KPUX and KFTG were down (Fig. 1). The majority of the Pueblo forecast area was without coverage. The return of KFTG can be seen at 0300 UTC. Reference figure 2 during discussion in the next two paragraphs. The first flood advisory was issued at 0027 UTC (24 Sep) for much of the Colorado Springs area. Abundant rain gauges, satellite imagery, lightning data, and spotter reports provided the information needed to issue the advisory. Prior to reports of heavy rain in Colorado Springs, heavy rain was reported in the more rural town of Pueblo West to the south. As the clouds associated with this rainfall streamed north, they cooled considerably, indicating to the forecaster that it was plausible Colorado Springs would receive rainfall at least to the degree of that being reported to the south. Nearby lightning strikes also indicated potential for localized heavy rainfall. Reports of heavy rainfall in Springs began to come in as the cooling clouds moved over the urban area, and along with the continued streaming of cooling clouds from the south, provided confidence to issue a flood advisory. Minor street and stream flooding was reported throughout the city along with one water rescue from Fountain Creek. The second flood advisory was issued at 0149 UTC over the Junkins Burn Scar, located in the Wet Mountains southwest of Pueblo. Previous posts on this blog have referenced the Junkins burn scar, which is the result of an October 2016 Wildfire. Burn scars pose a significant flash flood risk given the lack of debris and less porous nature of the land surface. There aren’t any rain gauges on the burn scar and spotters are scarce in the area, forcing the forecaster to rely even more on GOES-16 IR data. Cold cloud tops detected in GOES-16 5-min IR imagery were analyzed heading towards the burn scar. The forecaster on shift compared these cloud top temperatures with those associated with the heavy rain that was confirmed to have occurred in the Pueblo West and Colorado Springs areas. Given the similarities (clouds over Junkins just slightly warmer than those over Colorado Springs, but cooler than those over Pueblo West), the local sheriff’s departments were notified of the potential flood threat and a flood advisory was issued. Thankfully, there were no reports of flooding over or near the burn scar, but it is unclear whether or not moderate-heavy rainfall occurred. This event exemplifies the increased value of rapidly updating satellite imagery under unique circumstances such as radar outages. Severe storms developed across the Dakota’s ahead of and along a cold front in association with a potent shortwave on 19 September 2017. An SPC Enhanced risk was issued for tornadoes, significant hail, and significant wind. Given the threat, WFO Bismark requested and was granted a 1-min meso sector. Meanwhile, Hurricane Maria continued to advanced to the Northwest through the Atlantic toward Puerto Rico. The other meso sector was positioned over Hurricane Maria as requested by the National Hurricane Center. These two meso requests represent two of the top four priorities on the meso sector priority list in the event of multiple requests. Meso requests for SPC Enhanced risk is the number three priority, while meso requests for hurricane warnings over the US and its territories is number four. Only an SPC high/moderate risk (number one) or a Volcanic eruption affecting the US and its territories (number two) have higher priority. Irma was named a Tropical Storm on 30 August in the far eastern tropical Atlantic. Irma strengthened rapidly on 31 August to a Category 3, Major Hurricane. The NHC Day 4-5 forecast cone on 1 September put Irma just east of the Lesser Antilles as a Major Hurricane. With Irma outside of the GOES-16 5-min CONUS sector and no mesoscale sectors yet positioned over the storm, 15-min imagery was the highest temporal resolution available on the 1st. It is also important to remember that given the distance the storm was from GOES-16 nadir, the perceived spatial resolution was degraded as well. 1-min meso sectors from GOES-16 began tracking Irma on the 3rd. By the 4th, Irma continued to track west as a strong, category 3 major hurricane. 1-min satellite imagery from GOES-16 captured the eye of the storm during the morning of the 4th (Fig 2). By the morning of 5 September, Irma had strengthened to a category 5 major hurricane with 175 mph sustained winds! 1-min imagery continued to be available over the hurricane, providing striking views. The sandwich product, an image combination discussed in previous blog posts, combines visible and IR window imagery into one image. This visualization provides temperature information about the clouds in the storm while maintaining the high spatial resolution (Fig 3). Tuesday evening, Irma remained a strong category 5 hurricane packing sustained winds to 185 mph with a minimum central pressure of 926 mb. The NHC forecast had Irma near the southern Florida Peninsula on Sunday (Fig 4). Hurricane Irma passed over Antigua and Barbuda early on September 6, producing a measured wind gust of 155 mph before the anemometer broke. The 5 AM update from NHC kept Irma as a strong category 5 hurricane, with 185 mph sustained winds and a minimum central pressure of 914 mb. The previous day, GOES-16 began collecting 30-sec imagery over Irma by overlaying the two 1-min mesoscale sectors. 30-sec imagery over Irma continued into the 6th (Fig 5). 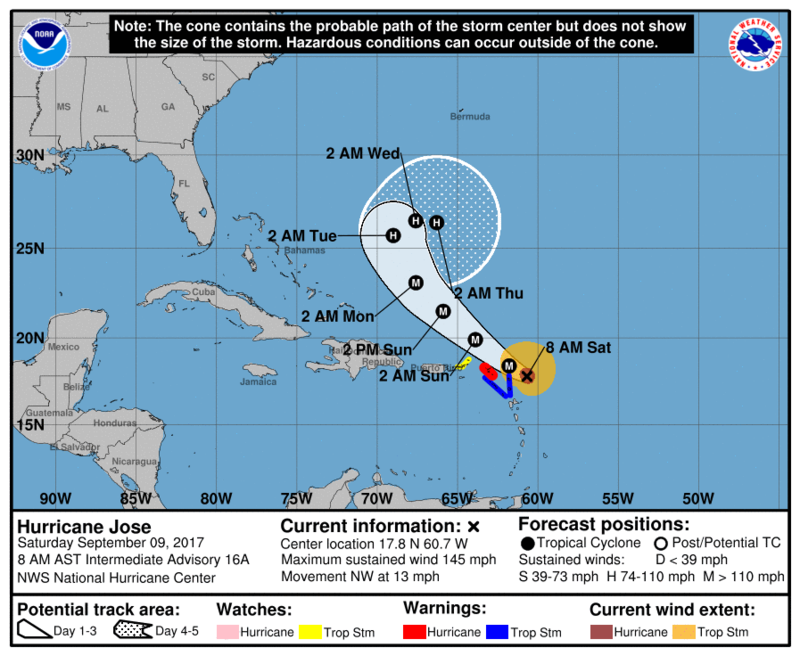 Two additional storms were named on Tuesday: Katia and Jose. Katia in the Gulf of Mexico is expected to impact Mexico, while Jose is currently forecast to remain in the Atlantic. A zoomed out view of GOES-16 Water Vapor Imagery from Tuesday night to Wednesday morning reveals these three tropical cyclones. Additionally, the upper-level trough over the eastern US is easily identified. This large-scale feature will continue to move east as a ridge builds behind it. Another smaller-scale trough will then move southeast, weakening the ridge, and helping to determine the eventual track of Irma. By Thursday early evening, Irma remained a strong category 5 major hurricane, packing sustained winds of 175 mph with a minimum central pressure of 922 mb. Today, we take a look at Irma in all 16 GOES-16 ABI spectral bands (Fig 7). As a reminder, the first two bands are in the visible, the next four are near-IR, and final ten are IR. Bands 8, 9, and 10 are the three water vapor bands. Aside from bands 7 (SWIR) and 12 (Ozone), all of the IR bands have almost the same temperature at the top of Irma since those clouds are at the top of the troposphere, above tropospheric moisture and CO2. The hurricane appears warmer in band 7 due to reflectance of solar radiation off of the cloud tops and Band 12 is warmer due to emission from ozone in the stratosphere where there is a temperature inversion. The two-day IR loop below shows the category 5 hurricane maintaining strength as it advances toward the US. Use the feature-following zoom tool in AWIPS to create animations such as the one below (Fig 8). On Friday the 8th, Irma remained a category 4 major hurricane packing 155 mph winds and a minimum central pressure of 924 mb. Irma was expected to turn more north late Saturday and head for the Florida Keys hitting the Keys early Sunday. A seamless transition of GOES-16 imagery from VIS (day) to IR (night) can be accomplished in AWIPS (Fig 9). Simply overlay VIS on IR, and make the lowest portion of the VIS color-table (0 – 0.5) transparent. The interaction of Irma with Cuba Friday night into Saturday morning caused it to weaken slightly to a category 3 hurricane with 125 mph max sustained winds and a minimum central pressure of 941 mb at the 11 AM Saturday update. Today we compare visible (Fig 10) imagery from GOES-16 (at 89.5 W) with that from GOES-13 (at 75 W, GOES-East). From GOES-16 today, one mesoscale sector is available over Irma providing imagery every minute. Meanwhile, GOES-13 is operating in Rapid Scan Mode, which provides imagery every 5, 7, 8, and 10 minutes (and 30-minutes every 3 hours for full disk). Spatially, the visible (IR) imagery from GOES-16 is 0.5 km (2 km), while that from GOES-13 is 1 km (4 km). Early Friday evening, Irma maintained category 3 strength as continued its west-northwest trajectory. Showers, thunderstorms, and strong winds were beginning to impact Florida and the Florida Keys. GOES-16 1-min VIS/IR sandwich combo imagery shows the impressive structure of Irma and thunderstorm activity over Florida. A few hours later, Irma began the turn north towards the Florida Keys as depicted in GOES-16 IR (Fig 11). Also included in the animation are NLDN cloud-to-ground lightning. There has been quite a bit of lightning activity, as expected, with the outer convective bands in the front right quadrant moving into southeast Florida. Several tornado warnings have been issued with at least two confirmed tornadoes in south Florida. 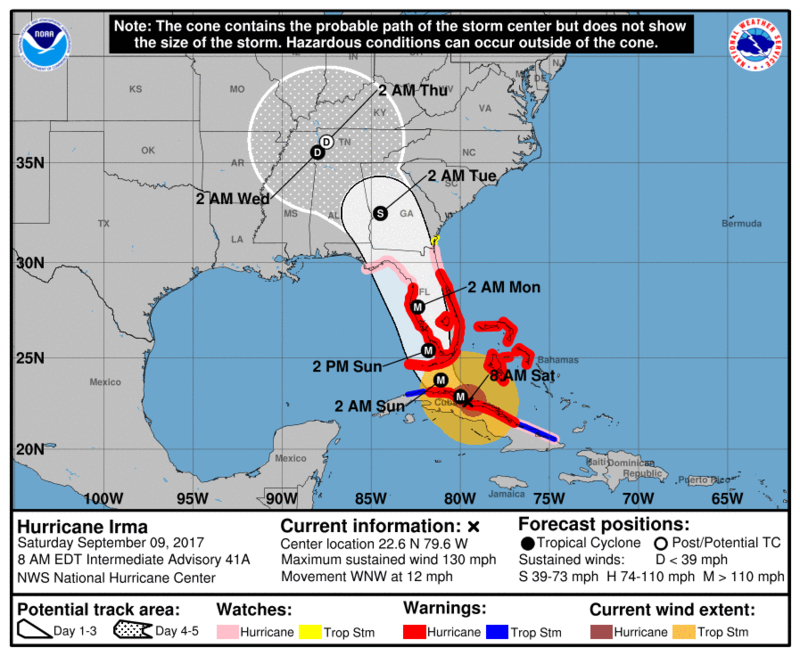 Hurricane Irma made landfall over the Florida Keys Sunday morning as a category 4 major hurricane. A 20 hour loop ending at 1415 UTC this morning, or just after landfall, shows the sharp turn north Irma took last night and its acceleration to and over the Keys (Fig 12). Irma again made landfall at 3:35 PM at Marco Island, Florida where a 130 mph wind gust was reported. Irma then advanced to Naples. 30-sec imagery was available from GOES-16 over the hurricane during landfall by overlapping the two mesoscale sectors. In the 30-sec VIS/IR sandwich combo, the eye is apparent along with bubbling convection in the front right quadrant.